Moms, here’s a wonderful and classic meal that is guaranteed to be a crowd pleaser. I tend to make this meal when I know were going to have a crazy filled week. It’s one of those make ahead meals that re-heats extremely well. I always whip this up when the kids are at school and I can blast my iPod and sing while cooking away. I’ve been making this dish for a long time. Quite frankly, this was the dish that I made for all of my college and post college boyfriends when I wanted to impress them. Everyone that eats this, literally loves it. It’s pure comfort food. 2 to 3 boneless, skinless chicken breast halves (halved horizontally) and pounded – Tip: If you shop at a grocery store with a butcher, have them cut and pound the chicken for you, as it will save you time and a big mess. 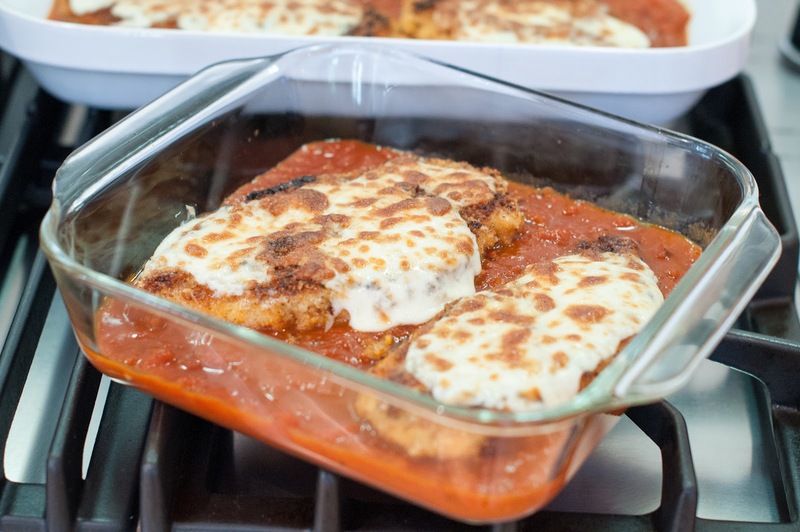 1-2 jars of your favorite tomato sauce or 2-3 cups of homemade sauce – It really depends on how many chicken breasts you use and how much sauce you like. I usually get 3 chicken breasts that are halved and pounded, (giving me 6 large cutlets) because I want dinner for 2 nights. If you just want this for just one night, then get 2 chicken breasts. It takes 1.5 jars of sauce to coat the bottom of the two pans below. I used a 9×13 pan and a 8×8 pan. Spread the tomato sauce on the bottom of a 9 x 13 or large lasagna style baking dish (if you’re making a double batch like me, then coat another small pan with some sauce as well). Get out 3 shallow bowls. Put some flour in the first bowl, beat 2 eggs in the second bowl and mix together your breadcrumbs and some freshly grated parmesan cheese in the third bowl (that third bowl has a cutlet in it, so that’s why it looks a bit strange). Note: I like mixing italian style breadcrumbs with some panko breadcrumbs to get a bit more crunch. Dip the chicken in the flour, then dip it in the eggs and then dredge it in breadcrumb parmesan mixture, turning to coat both sides. Heat 2 tablespoons olive oil in a large skillet (non-stick preferably if you have one) over medium heat. Note: You’re going to use a lot of olive oil here if you have a regular skillet. 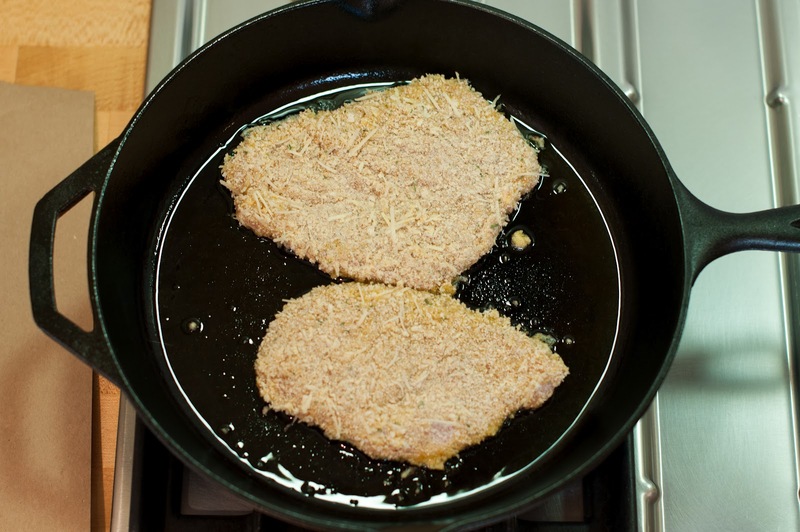 A non-stick skillet or a cast-iron pan is recommend when making chicken cutlets because you use less oil and the breadcrumbs will not stick to the pan. While your olive oil is heating up, grab a plate and put some paper towels on it. You will use this to pat your chicken with after it has been sautéed. 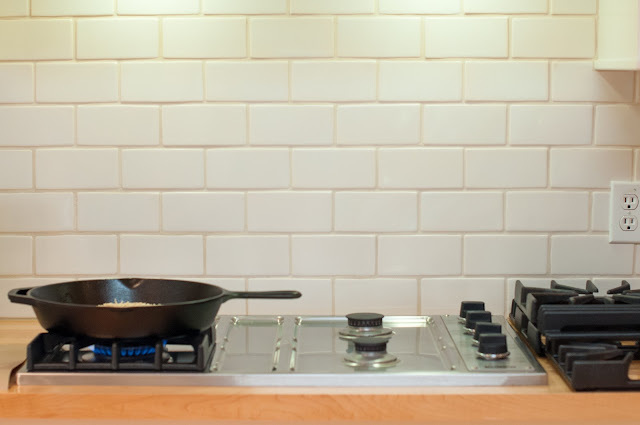 Tip: Whenever I fry something on the stove I take off all of the burners (besides the one that is being used). This helps with clean up, as I just have to wipe down the stove and not the burners. Place 1 to 2 chicken cutlets in your skillet; cook until golden brown on each side. I’m not giving any time estimates here because the cooking time will depend on the thickness of you chicken cutlet. I usually pull them out when I see that the chicken is no longer pink on the inside. Tip: I also use a meat thermometer to test the doneness of the chicken. I take the chicken off when the internal temp is at or close to 165 degrees. Using a pair of tongs, transfer the chicken to the plate with the paper towels and pat the cutlet to get rid of the excess oil. You’ll want to use fresh paper towels with each cutlet. 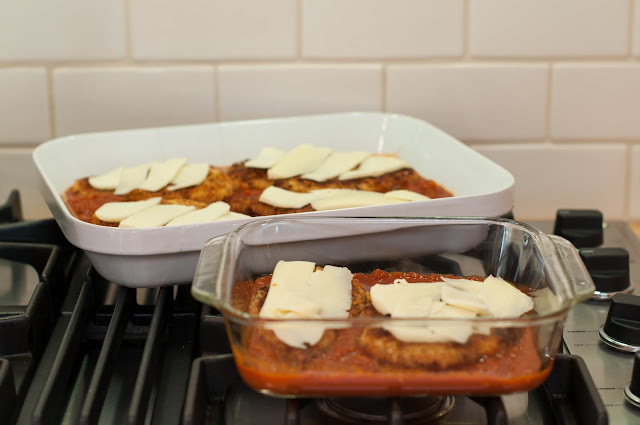 Transfer the chicken cutlet to your baking dish, placing it on top of the sauce. Repeat this process with your remaining cutlets. Turn on your broiler. 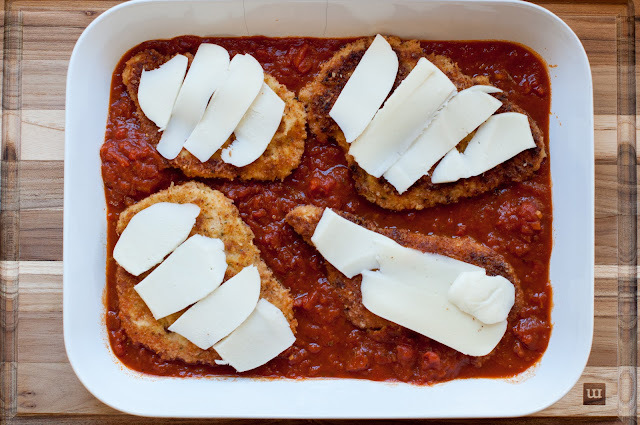 Thinly slice up your mozzarella cheese and top each chicken cutlet with a slice or two (or three)! We like our mozzarella so I put plenty on. Broil uncovered, about 6-8 inches from heat source until the sauce is hot and the cheese is melted and lightly browned in spots, 5 to 8 minutes. Serve immediately, or if you’re making this meal ahead of time, let it cool a bit on the stove and then cover tightly with tin foil and place in the refrigerator till later. To reheat: Cook uncovered in a 350 degree oven for about 30 minutes or until the sauce is bubbly and the chicken is warmed through. Pair this with a vegetable of choice or a fresh salad and some crispy garlic bread. To make this a two-nighter meal, you can top the chicken on a bed of spaghetti or get some french bread, broil it and make some chicken parmesan subs. 2 to 3 boneless, skinless chicken breast halves (halved horizontally) and pounded - Tip: If you shop at a grocery store with a butcher, have them cut and pound the chicken for you, as it will save you time and a big mess. 1-2 jars of your favorite tomato sauce or 2-3 cups of homemade sauce - It really depends on how many chicken breasts you use and how much sauce you like. I usually get 3 chicken breasts that are halved and pounded (giving me 6 large cutlets) because I want dinner for 2 nights. If you just want this for just one night, then get 2 chicken breasts. When I'm making this for 2 nights, I typically use a 9x13 pan and a 8x8 pan and it takes 1.5 jars of sauce to cover the bottom of the two pans. 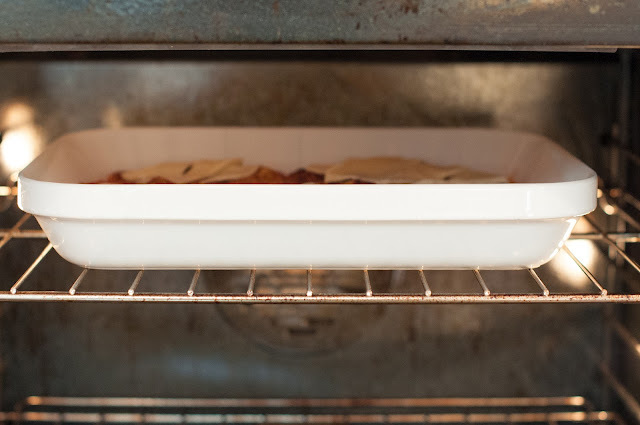 Spread the tomato sauce on the bottom of a 9 x 13 or large lasagna style baking dish (if you're making a double batch like me, then coat another small pan with some sauce as well). Get out 3 shallow bowls. Put some flour in the first bowl. Beat 2 eggs in the second bowl. 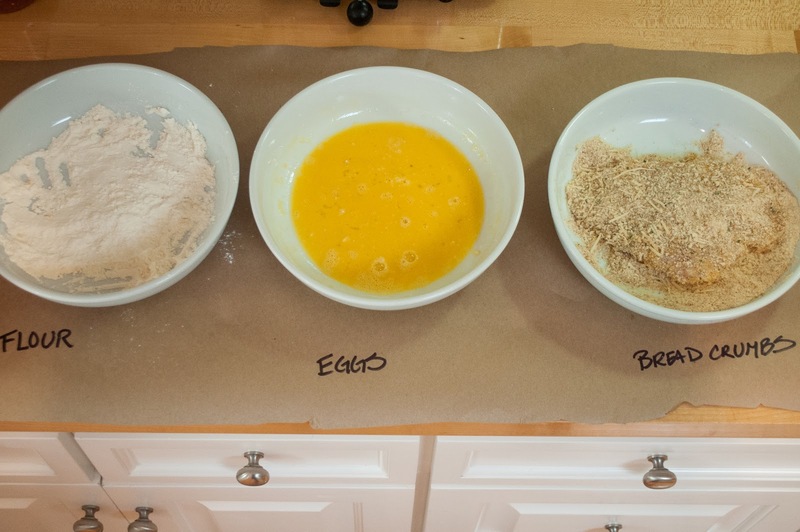 Mix together your breadcrumbs and some freshly grated parmesan cheese in the third bowl. Note: I like mixing italian style breadcrumbs with some panko breadcrumbs to get a bit more crunch. Dip the chicken in the flour, then dip it in the eggs and then dredge it in breadcrumb parmesan mixture, turning to coat both sides. Heat 2 tablespoons olive oil in a large skillet (non-stick preferably if you have one) over medium heat. Note: You're going to use a lot of olive oil here if you have a regular skillet. 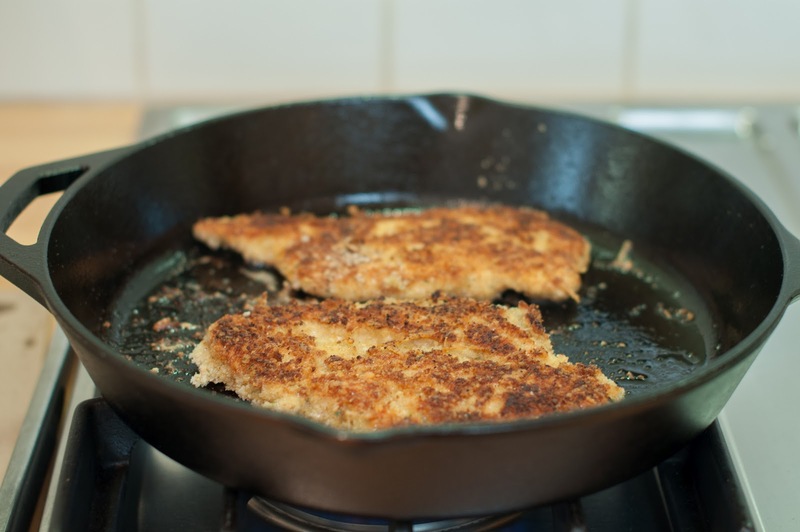 A non-stick skillet or a cast-iron pan is recommend when making chicken cutlets because you use less oil and the breadcrumbs will not stick to the pan. While your olive oil is heating up, grab a plate and put some paper towels on it. You will use this to pat your chicken with after it has been sautéed. Tip: Whenever I fry something on the stove I take off all of the burners (besides the one that is being used). This helps with clean up, as I just have to wipe down the stove and not the burners. Place 1 to 2 chicken cutlets in your skillet; cook until golden brown on each side. I'm not giving any time estimates here because the cooking time will depend on the thickness of you chicken cutlet. I usually pull them out when I see that the chicken is no longer pink on the inside. Tip: I also use a meat thermometer to test the doneness of the chicken. I take the chicken off when the internal temp is at or close to 165 degrees. Using a pair of tongs, transfer the chicken to the plate with the paper towels and pat the cutlet to get rid of the excess oil. You'll want to use fresh paper towels with each cutlet. Thinly slice up your mozzarella cheese and top each chicken cutlet with a slice or two (or three)!We like our mozzarella so I put plenty on. Broil uncovered, about 6-8 inches from heat source until the sauce is hot and the cheese is melted and lightly browned in spots, 5 to 8 minutes. Serve immediately, or if you're making this meal ahead of time, let it cool a bit on the stove and then cover tightly with tin foil and place in the refrigerator till later. To re-heat: cook uncovered in a 350 degree oven for about 30 minutes or until the sauce is bubbly and the chicken is warmed through. Does this not get soggy if you make it the night before? I have made this before and it’s nice and crisp but would like to try it by making ahead for busy nights but fear the crispiness will be lost. Hi there, I always post on someone’s blog if I try the recipe and I just have to say this was absolutely delicious! I found a really good marinara sauce called Marzettis and made the recipe according to your instructions (and great pictures) and it turned out great. Thanks for taking the time to post these recipes for people like me who don’t have a lot of time! Hi, plan to try this recipe tonight for my boys!! I tried this recipe tonight and loved it! I have tried so many variations of the chicken parm and it was always a little off. I tried some of your other recipes and loved them (turkey burgers, sausage + spinach stew, kale salad) so I thought, why not? Turned out so great! Definitely going into my rotation. I hope you keep up this blog! I enjoy your recipes because they are healthy, straight forward, and tasty. Not easy to do! When do you add the parmasean? YUM!!!! My first main dish from your site was a smashing success! This was soooo decadent for a weeknight meal, and we have lots of leftovers! Loved loved loved!!! Had my Whole Foods butcher halve and pound the breasts and the rest was pretty easy. What a treat! My (picky) 10-year-old daughter proclaimed it tasted like “pizza french fries.” I’ll take it, because she ate what I cooked and that doesn’t happen very often. This recipe is a keeper for sure! Yaay Kyla! I’m so happy to hear that your first main dish was a smashing success. It’s decadent dish, but what’s great about it is that you always have leftovers for the next night, so it’s two dinners in one. I always have my butcher at Whole Foods pound the meat for me as well. It really saves a pretty messy and yucky step. I hate pounding meat, blah! So glad your picky 10 year old loved it as well. I love her reference to “pizza french fries.” Anyway, thanks for giving me a shout out and letting me know how it turned out. Have a great weekend! Some visit me at http://www.yummymummykitchen.com for some festive holiday recipes.